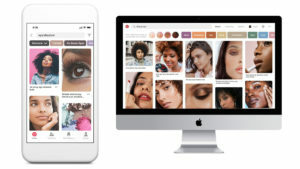 Pinterest has announced the US mobile expansion of its skin tone range search tool, which began beta testing in April 2018. The feature enables Pinterest users in the US to customise their beauty searches further by selecting one of four shade ranges most relevant to their needs. The skin tone feature aims to personalise makeup, hair, and skin care searches to be more inclusive for the more than 200m monthly Pinterest users. Until now, the beta version has only been available on desktop computers but will become available on iOS and Android devices in the coming weeks. Women on Pinterest are 2.4 times more likely to experiment with different makeup, compared to women using other platforms. Now, popular Pinterest searches like ‘glossy makeup’ (searches up 89 per cent), ‘stand out lip colours’ (up 467 per cent), and ‘going grey’ (up 879 per cent) can have results narrowed down to pale, medium, or dark tones. According to Pinterest, last year nearly 60 per cent of the top 100 search terms for skin-related searches involved skin tone such as dark skin, pale skin, or olive skin. The platform stated that skin tone preferences will not be saved nor used to customise user profiles, so a skin tone range will need to be selected with each new use. Pinterest will make the feature available to the US via a Pinterest app update, and eventually aim to make the tool available globally. Pinterest also plans on releasing many more skin tone ranges with regards to customer feedback.